Waves continues to offer theme-based "1+1" deals on plugins, with the H-Delay plugin free when you purchase H-Comp today only. 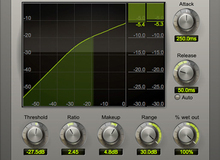 For a limited (yet unspecified) time, JST offers its Finality Advanced limiter plugin for $39. Noisebud has released Bipro, a new low-end dedicated compressor plug-in. Slate Digital has released the FG-116 Blue Series, a bundle of two 1176-inspired compressor plugins for VMR.